If you’re sitting at work while your DVR records “The Real Housewives of New Jersey,” “Jersey Shore,” “Jerseylicious” and “Everybody Loves Raymond,” it might actually be using up more power than your air conditioner or refrigerator. Yea, seriously. 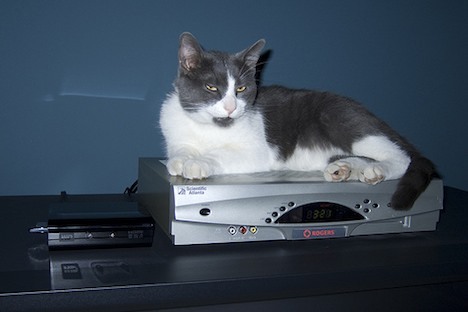 Most homes own at least one basic cable box with an add-on digital video recorder, used to record movies and television shows as they are aired, even if the TV isn’t on. One cable box and one DVR use about 10 percent more kilowatt hours a year than a 21 foot energy-efficient refrigerator. Basically, much more than you’d expect by looking at the tiny boxes or thinking about the “small” task they’re performing. According to the Natural Resources Defense Council, these boxes consume about $3 billion worth of energy each year in the United States alone. Power that is, in retrospect, a huge waste because the majority of it isn’t even expelled while you are watching television. Plus, how many “King of Queens” reruns can one person watch, anyway? Similar electronics in European countries can be set to go into stand-by mode which can cut energy use in half. Americans who have been given the option of receiving these products go for the energy hog because of the lesser amount of time it takes to reboot and get it going, when it’s time to watch some “Bridezillas” after a long day at the office. Needless to say, energy efficiency isn’t at the top of most people’s priority lists. No time to waste when “16 and Pregnant” is coming on! This is almost equivalent to the fact that so many people will eyeball the entire room from the couch for 15 minutes in order to find the remote, and will fall asleep with a burrito in their hand before actually getting up to change the channel. Except this time getting up isn’t even necessary, it’s the fact that people can’t wait for a machine to boot up. If you live in the United States, it’s not like you’re watching good TV anyway. I wonder how much coal a DVR player uses. 48% of our electricity comes from coal but not many people link mercury and other environmental regulations, to recording their favorite TV shows on their DVR The Powering a Nation (poweringanation.org) student-run news site is looking into our complicated relationship with coal. “Coal: A Love Story – Can’t live with it. Can’t live without it.” is due to launch July 22. There is a blog that is constantly being updated (coalalovestory.com).